Albert Maignan's Green Muse (1895): a poet succumbs to the Green Fairy. Absinthe ( i/ˈæbsɪnθ/ or /ˈæbsænθ/; French: [apsɛ̃t]) is historically described as a distilled, highly alcoholic (45–74% ABV / 90–148 U.S. proof) beverage. 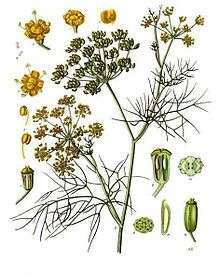 It is an anise-flavoured spirit derived from botanicals, including the flowers and leaves of Artemisia absinthium ("grand wormwood"), together with green anise, sweet fennel, and other medicinal and culinary herbs. 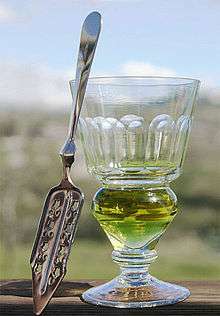 Absinthe traditionally has a natural green colour but may also be colourless. It is commonly referred to in historical literature as "la fée verte" (the green fairy). Although it is sometimes mistakenly referred to as a liqueur, absinthe is not traditionally bottled with added sugar; it is therefore classified as a spirit. Absinthe is traditionally bottled at a high level of alcohol by volume, but it is normally diluted with water prior to being consumed. Absinthe has often been portrayed as a dangerously addictive psychoactive drug and hallucinogen. The chemical compound thujone, although present in the spirit in only trace amounts, was blamed for its alleged harmful effects. By 1915, absinthe had been banned in the United States and in much of Europe, including France, the Netherlands, Belgium, Switzerland and Austria-Hungary. Although absinthe was vilified, it has not been demonstrated to be any more dangerous than ordinary spirits. Recent studies have shown that absinthe's psychoactive properties (apart from that of the alcohol) have been exaggerated. 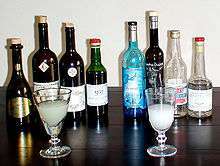 A revival of absinthe began in the 1990s, following the adoption of modern European Union food and beverage laws that removed longstanding barriers to its production and sale. By the early 21st century, nearly 200 brands of absinthe were being produced in a dozen countries, most notably in France, Switzerland, Australia, Spain, and the Czech Republic. 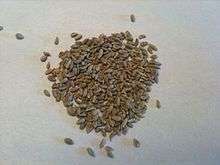 Some claim that the word means "undrinkable" in Greek, but it may instead be linked to the Persian root spand or aspand, or the variant esfand, which meant Peganum harmala, also called Syrian Rue—although it is not actually a variety of rue, another famously bitter herb. That Artemisia absinthium was commonly burned as a protective offering may suggest that its origins lie in the reconstructed Proto-Indo-European root *spend, meaning "to perform a ritual" or "make an offering". Whether the word was a borrowing from Persian into Greek, or from a common ancestor of both, is unclear. Alternatively, the Greek word may originate in a pre-Greek Pelasgian word, marked by the non-Indo-European consonant complex νθ (-nth). Absinthe has been consumed in the Czech countries (then part of Austria-Hungary) since at least 1888, notably by Czech artists, some of whom had an affinity for Paris, frequenting Prague's famous Café Slavia. Its wider appeal in Bohemia itself is uncertain, though it was sold in and around Prague. It is claimed that at least one local liquor distillery in Bohemia was producing absinthe at the turn of the 20th century. In the Netherlands, the restrictions on the manufacture and sale of absinthe were successfully challenged by the Amsterdam wine seller, Menno Boorsma, in July 2004, thus confirming the legality of absinthe once again. Similarly, Belgium lifted its longstanding absinthe ban on January 1, 2005, citing (as did the Dutch judge) a conflict with the adopted food and beverage regulations of the Single European Market. 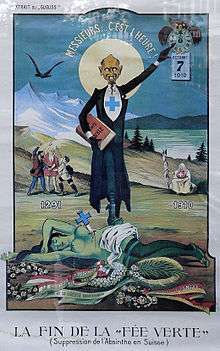 In Switzerland, the constitutional ban on absinthe was repealed in 2000 during an overhaul of the national constitution, although the prohibition was simultaneously rewritten into ordinary law instead. That law was later repealed such that as of March 1, 2005, absinthe was made again legal in its country of origin. Absinthe is once again distilled and sold in its Val-de-Travers birthplace, with Kübler and La Clandestine Absinthe among the first new brands to re-emerge. Absinthe has never been illegal to import or manufacture in Australia. Importation requires a permit under the Customs (Prohibited Imports) Regulation 1956 due to a restriction on importing any product containing "oil of wormwood". In 2000, an amendment proposed by Foods Standards Australia New Zealand (FSANZ) as part of a new consolidation of the Food Code across Australia and New Zealand, made all wormwood species prohibited herbs for food purposes under Food Standard 1.4.4. Prohibited and Restricted Plants and Fungi. However, this amendment was found inconsistent with other parts of the preexisting Food Code. The proposed amendment was withdrawn in 2002 during the transition between the two codes, thereby continuing to allow absinthe manufacture and importation through the existing permit-based system. These events were erroneously reported by the media as Australia having reclassified it from a prohibited product to a restricted product. Since this clarification was made, what is claimed to be the first Australian-produced brand of absinthe (Moulin Rooz) was released in 2007. In 2007, the French Lucid brand became the first genuine absinthe to receive a COLA (Certificate of Label Approval) for importation into the United States since 1912, following independent efforts by representatives from Lucid and Kübler to overturn the long-standing US ban. In December 2007, St. George Absinthe Verte, produced by St. George Spirits of Alameda, California, became the first brand of American-made absinthe produced in the United States since the ban. Since that time, other micro-distilleries have started producing small batch artisanal absinthes in the US. This step also provides a herbal complexity that is typical of high quality absinthe. 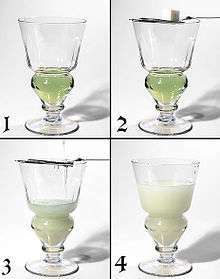 The natural colouring process is considered critical for absinthe ageing, since the chlorophyll remains chemically active. The chlorophyll serves a similar role in absinthe that tannins do in wine or brown liquors. Absenta ("absinthe" in Spanish) is sometimes associated with a regional style that often differed slightly from its French cousin. Traditional absentas may taste slightly different due to their use of Alicante anise, and often exhibit a characteristic citrus flavour. One study published in the Journal of Studies on Alcohol concluded that high doses (0.28 mg/kg) of thujone in alcohol had negative effects on attention performance in a clinical setting. It delayed reaction time, and caused subjects to concentrate their attention into the central field of vision. Low doses (0.028 mg/kg) did not produce an effect noticeably different from the plain alcohol control. While the effects of the high dose samples were statistically significant in a double blind test, the test subjects themselves were unable to reliably identify which samples contained thujone. For the average 65 kg (143 lb) man, the high dose samples in the study would equate to 18.2 mg of thujone. The EU limit of 35 mg/L of thujone in absinthe means that given the highest permitted thujone content, one would have to consume approximately 0.5 litres to reach the measured effects, a feat likely to cause alcohol poisoning. 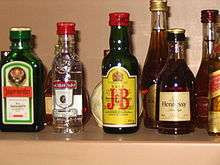 Most countries (except Switzerland) at present do not possess a legal definition of absinthe (unlike Scotch whisky or cognac). Accordingly, producers are free to label a product 'absinthe' or 'absinth', whether or not it bears any resemblance to the traditional spirit. 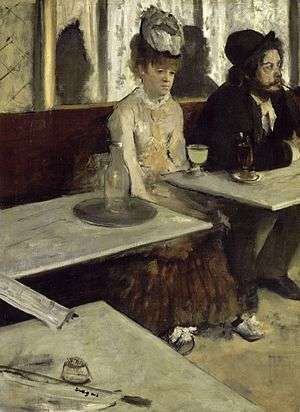 Numerous artists and writers living in France in the late 19th and early 20th centuries were noted absinthe drinkers, and featured absinthe in their work. Some of these included Édouard Manet, Guy de Maupassant, Amedeo Modigliani, Arthur Rimbaud, Henri de Toulouse-Lautrec, Paul Verlaine, Vincent van Gogh, Oscar Wilde, and Émile Zola. Many other renowned artists and writers similarly drew from this cultural well, including Aleister Crowley, Ernest Hemingway, Pablo Picasso, and August Strindberg. ↑ Chisholm, Hugh, ed. (1911). "Absinthe". Encyclopædia Britannica. 1 (11th ed.). Cambridge University Press. p. 75. 1 2 Padosch, Stephan A; Lachenmeier, Dirk W; Kröner, Lars U (2006). 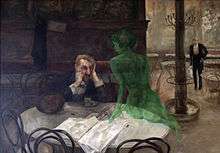 "Absinthism: a fictitious 19th century syndrome with present impact". Substance Abuse Treatment, Prevention, and Policy. 1: 14. doi:10.1186/1747-597X-1-14. ↑ ἀψίνθιον. Liddell, Henry George; Scott, Robert; A Greek–English Lexicon at the Perseus Project. ↑ Lucretius. "Titi lvcreti cari de rervm natvra liber qvartvs". Archived from the original on 20 August 2008. Retrieved 2008-09-17. ↑ "Absinthe etymology". Gernot Katzer's Spice Pages. Retrieved 2012-02-12. ↑ "Absinth: Short explanation of the adoption of the absinth spelling by Bohemian producers". La Fee Verte Absinthe. Archived from the original on 17 September 2008. Retrieved 2008-09-17. ↑ Henry George Liddell; Robert Scott (1940). "ἀψινθίτης". A Greek–English Lexicon. Retrieved 2013-03-09. 1 2 Absinthe FAQ III Retrieved Aug. 20, 2014. ↑ Lemons, Stephen (2005-04-07). "Behind the green door". phoenix new times. Retrieved 2008-09-18. ↑ Verte, Peter. "The Fine Spirits Corner". Absinthe Buyers Guide. Archived from the original on 5 May 2008. Retrieved 2008-04-11. 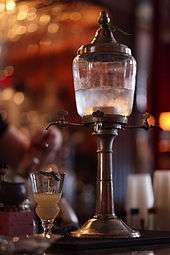 ↑ "The Virtual Absinthe Museum: Absinthe in America—New Orleans". Oxygenee Ltd. Archived from the original on 8 September 2008. Retrieved 1 December 2016. ↑ "History - Old Absinthe House". Retrieved 1 December 2016. ↑ "History of Absinth(e)". Oliva Absinth's History of Absinthe. Archived from the original on 8 March 2009. Retrieved 2008-09-18. ↑ Barnaby, Conrad III (1988). Absinthe History in a Bottle. Chronicle Books. p. 116. ISBN 0-8118-1650-8. ↑ Page 411 of the 1970 Penguin Classics English edition. ↑ Carvajal, Doreen (2004-11-27). "Fans of absinthe party like it's 1899". International Herald Tribune. Retrieved 2008-09-18. 1 2 United States Brewers' Association. The 1916 Year Book of the United States Brewers' Association. Published 1916. Page 82 (Google Books link). Accessed Nov-23-2009. ↑ Verte, Peter. "The Fine Spirits Corner". Absinthe Buyer's Guide. Archived from the original on 24 September 2008. Retrieved 2008-09-18. ↑ "Modern Revival of Absinthe". Absinthe.se. Retrieved 2012-02-12. ↑ "Absinthe History and FAQ VI". Thujone.info. Retrieved 2012-02-12. ↑ "Unmasking the green fairy". Praguepost.com. Retrieved 2012-02-12. ↑ "Strong stuff". London: Telegraph. 2001-07-27. Retrieved 2012-07-24. ↑ Anna Pursglove (4 August 2000). "What's your poison?". London Evening Standard. Retrieved 1 December 2016. ↑ "Cellar Trends". Cellar Trends. Retrieved 2012-07-24. ↑ "Absinthe Tale", Difford, Simmon, Class Magazine (May/June 2009, pp. 88-93). ↑ "Absinthe Laws". Retrieved 11 March 2013. ↑ Schedule 8 Commonwealth of Australia Customs (Prohibited Imports) Regulations 1956, Schedule 8. Retrieved 29 December 2006. ↑ "Australian Food Standards PDF" (PDF). Australia New Zealand Food Authority. Retrieved 1 December 2016. ↑ "STANDARD 1.4.4 - PROHIBITED AND RESTRICTED PLANTS AND FUNGI" (PDF). Food Standards Australia New Zealand. Archived from the original (PDF) on 10 January 2006. Retrieved 1 December 2016. ↑ Cindy Skrzycki (16 October 2007). "A Notorious Spirit Finds Its Way Back to Bars" (PDF). Washington Post. Archived (PDF) from the original on 5 March 2009. Retrieved 2009-02-24. ↑ Contact Brent Rose (2012-06-08). "Absinthe Pops: The Frozen Treat That Will Melt Your Face". Gizmodo.com. Retrieved 2012-06-12. ↑ "Ice lolly made from holy water and absinthe goes on sale - Weird News". Digital Spy. 2012-05-31. Retrieved 2012-06-12. ↑ Ross, Ellie (2012-05-30). "Vice lolly | The Sun |News". London: The Sun. Retrieved 2012-06-12. ↑ Campion, Vikki (2012-06-08). "Sydney's small bar revolution is teaching people a new way to drink | thetelegraph.com.au". DailyTelegraph.com.au. Retrieved 2012-06-12. ↑ "Official FFS Press Release confirming the repeal of the 1915 French Absinthe Ban: Article 175; point 20" (PDF). ↑ "Aide-Mémoire: production d'absinthe." (PDF). ↑ Kallisti. "Historical Recipes". Feeverte.net. Archived from the original on 20 September 2010. Retrieved 2010-08-14. ↑ Chu, Louisa (2008-03-12). "Crazy for absinthe". Chicago Tribune. Archived from the original on 2008-03-14. ↑ Duplais, MM. "A TREATISE on the MANUFACTURE AND DISTILLATION of ALCOHOLIC LIQUORS" (PDF). Distiller's Manual. The Wormwood Society. Retrieved 9 October 2012. 1 2 "Class Mag May/June 2009 La Fee - Buy alcoholic liquor online". 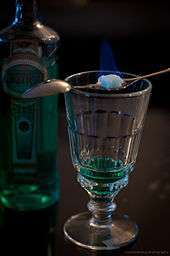 Lafeeabsinthe.com. Retrieved 2 December 2016. ↑ "Absinthe - the Green (or pink or red) Fairy". Distillique. Retrieved June 4, 2016. ↑ "Rosinette Absinthe Rose Oxygénée". 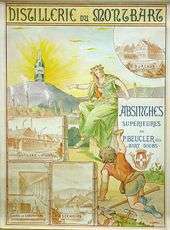 Musée Virtuel de l'Absinthe. Oxygenee (France) Ltd. Retrieved 25 July 2016. ↑ "Absinth-Guide.de". Archived from the original on May 9, 2015. Retrieved February 8, 2009. ↑ "About absinthe kits". wormwoodsociety. Archived from the original on 2008-04-19. Retrieved 2008-09-17. ↑ Evolution in Action! Gumbo Pages. Dangers of drinking wormwood extract. Retrieved 26 August 2007. ↑ Laura Halpin Rinsky; Glenn Rinsky (2009). The Pastry Chef's Companion: A Comprehensive Resource Guide for the Baking and Pastry Professional. Chichester: John Wiley & Sons. p. 1. ISBN 0-470-00955-1. OCLC 173182689. ↑ Simon, Kate (2010). Absinthe Cocktails: 50 Ways to Mix with the Green Fairy. Chronicle Books. p. 33. ISBN 1-4521-0030-6. ↑ "How to buy and drink good quality absinthe". Wormwoodsociety.org. Retrieved 2012-07-14. ↑ "Professors of Absinthe Historic account of preparation at a bar.". Oxygenee Ltd. Archived from the original on 5 September 2008. Retrieved 2008-09-18. ↑ Dorelli, Peter (1999). Savoy Cocktail Book. Anova Books. ISBN 1-86205-296-4. ↑ McGee, Harold (2008-01-03). "Trying to Clear Absinthe's Reputation". The New York Times. Retrieved 2008-09-17. ↑ Shenton, Will (2016-02-24). "Everything You Need to Know About Absinthe". Bevvy. Retrieved 2016-10-24. ↑ Verte, Peter. "Fine Spirits Corner". absinthe buyers guide. Archived from the original on 24 September 2008. Retrieved 2008-09-17. ↑ "The Absinthe Buyer's Guide: Modern & Vintage Absinthe Reference: Spain Archives". La Fee Verte. Archived from the original on 15 September 2008. Retrieved 2008-09-17. ↑ "Absinthe bootleggers refuse to go straight". Swiss info. 2006-03-11. Retrieved 2008-09-17. ↑ "Worthy of their name". The Prague Post. 2006-04-26. Archived from the original on 2007-09-30. Retrieved 2007-05-20. ↑ Rosen, Jennifer (2007-09-07). "Absinthe Without Leave". Feature Article. Novus Vinum. Retrieved 2008-11-05. ↑ Salleh, Anna. Absinthe's Mystique Cops a Blow, ABC Science, May 1, 2008. ↑ Castillo, J. Del; Anderson, M.; Rubottom, G.M. (1975). "Letters to Nature: Marijuana, absinthe and the central nervous system". Nature. 253 (5490): 365–366. doi:10.1038/253365a0. ↑ Meschler JP, Howlett AC (March 1999). "Thujone exhibits low affinity for cannabinoid receptors but fails to evoke cannabimimetic responses". Pharmacol. Biochem. Behav. 62 (3): 473–80. doi:10.1016/S0091-3057(98)00195-6. PMID 10080239. ↑ "The Mystery of the Green Menace—Wired Magazine (see page 3 of article)". Wired-vig.wired.com. 2009-01-04. Retrieved 2010-08-14. ↑ K.C. Rice and R.S. Wilson, J. Med. Chem. 19: 1054–1057, 1976. Cited by Jiří Patočka and Bohumil Plucar, Pharmacology and toxicology of absinthe, Journal of Applied Biomedicine, 1: 199–205, 2003. Retrieved February 8, 2009. ↑ A study of plants in central Italy reported some veterinary use of wormwood as an anthelmintic for cows. Guarrera, P.M. (1999). "Traditional antihelmintic, antiparasitic and repellent uses of plants in central Italy". J Ethnopharmacol. 68 (1–3): 183–192. doi:10.1016/s0378-8741(99)00089-6. ↑ Ian Hutton: Myth, Reality and Absinthe, Current Drug Discovery, 2002, 9, page 63 "Common adulterants were cupric acetate (to provide the valued green color)"
↑ [The Effects of Absinthe; Emma S. Walker, M.D., Medical Record 1906] "...the alcohol employed in this liquor is frequently very impure...the bitter principle of absinthium, absinthin (from oil of wormwood), is a narcotic poison...not infrequently copper salts have been used in order to produce the green color." ↑ [The Mixicologist; C.F. 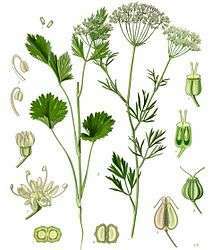 Lawler, 1895] "The distillers of Bensaçon, Pontarlier, and Couvet hit on the idea of distilling the Absinthe herb (wormwood), adding annis [sic], fennel, and coriander seeds, etc., ad lib., these making an agreeable beverage. 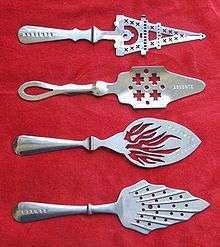 Absinthe so made soon had considerable success, which had the usual effect of bringing out the injurious trash made from oils, essences, etc. " ↑ Ian Hutton, page 62, "quoted by Arnold"..."Arnold WN (1989) Absinthe: Scientific American 260(6):112–117"
↑ Lachenmeier, Dirk W.; Nathan-Maister, David; Breaux, Theodore A.; Sohnius, Eva-Maria; Schoeberl, Kerstin; Kuballa, Thomas (2008). "Chemical Composition of Vintage Preban Absinthe with Special Reference to Thujone, Fenchone, Pinocamphone, Methanol, Copper, and Antimony Concentrations". Journal of Agricultural and Food Chemistry. 56 (9): 3073–3081. doi:10.1021/jf703568f. PMID 18419128. 1 2 Hold, K. M. (2000). "alpha -Thujone (the active component of absinthe): gamma -Aminobutyric acid type A receptor modulation and metabolic detoxification". Proceedings of the National Academy of Sciences. 97 (8): 3826–3831. doi:10.1073/pnas.070042397. PMC 18101 . PMID 10725394. ↑ Weisbord, S. D.; Soule, J. B.; Kimmel, P. L. (1997). 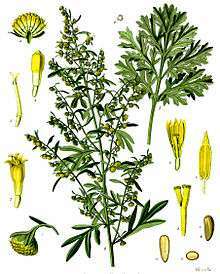 "Poison on Line – Acute Renal Failure Caused by Oil of Wormwood Purchased through the Internet". N. Engl. J. Med. 337: 825–827. doi:10.1056/nejm199709183371205. ↑ Absinthe: Attention Performance and Mood under the Influence of Thujone Journal of Studies on Alcohol, DETTLING, A. et al. Retrieved 2 December 2016. ↑ Schedule 19 - Maximum levels of contaminants and natural toxicants Food Standards Australia New Zealand. Retrieved 1 December 2016. ↑ "Prohibited / Restricted Goods - Frequently asked questions". Australian Customs and Border Protection Service. Archived from the original on 2 February 2015. Retrieved 2 December 2016. ↑ McDowell, Adam. "Happy Hour's Guide to Absinthe: What can I buy in Canada?". National Post. Retrieved 2 December 2016. ↑ Regulation (EC) No 1334/2008 of the European Parliament and Council of 16 December 2008, European Commission. ↑ Décret n°88–1024 du 2 novembre 1988. Retrieved 5 March 2006. ↑ Aggelos (2010-11-05). "French decree on fenchone and pinocamphone repealed". Gazetteabsinthe.com. Retrieved 2012-07-24. ↑ "Absinthe in France: Legalising the 'green fairy'". BBC News. 2011-05-04. ↑ "European Union PDF document" (PDF). Archived (PDF) from the original on 10 September 2008. Retrieved 2008-09-18. see thujon in table on page 11. ↑ Gerken, Sonia (2008-08-30). "Liquor ban after teen's near death". The Southland Times. Retrieved 2008-09-18. ↑ "Absint—"Den gröna feen"" (in Swedish). Systembolaget. Retrieved 2008-09-18. ↑ "Ordonnance du DFI sur les boissons alcooliques : Art. 80 Absinth". Confédération Suisse. 2008-04-01. Retrieved 2008-09-18. ↑ "Download from Confédération Suisse Website: see pages 3–4" (PDF). Confédération Suisse. 2005-02-07. Archived (PDF) from the original on 10 September 2008. Retrieved 2008-09-18. ↑ Bosley, Catherine (13 August 2014). "Absinthe Loses Battle for Swiss Brand Protection Like Emmentaler". Bloomberg. Retrieved 13 August 2014. ↑ "Code of Federal Regulations, Title 21, Chapter I, Part 172, Section 172.510—Food Additives Permitted for Direct Addition to Food for Human Consumption". US Food and Drug Administration. Archived from the original on 21 September 2008. Retrieved 2008-09-17. ↑ "Alcohol Tax and Trade Bureau Industry Circular Number 2007-5". Retrieved 2008-09-17. ↑ "Rediscovering Absinthe: Removing The Green Fairy From The Banned List". Retrieved 17 September 2008. ↑ "Alcohol Tax and Trade Bureau "Screening of Distilled Spirits for Thujone by Gas Chromatography-Mass Spectrometry". Alcohol and Tobacco Tax and Trade Bureau. Archived from the original on 17 September 2008. Retrieved 2008-09-17. ↑ "The Virtual Absinthe Museum: US Legalization in 2007 after 95 years of prohibition.". Retrieved 1 December 2016. ↑ "Know Before You Go" (PDF). U.S. Customs and Border Protection. Archived from the original (PDF) on 2009-05-27. Retrieved 2009-10-13. ↑ "Prohibited and Restricted Items.". US Customs and Border Protection. Retrieved 1 December 2016. ↑ "TTB Online". Archived from the original on 20 February 2012. Retrieved 1 December 2016. ↑ "Absente FAQ". Archived from the original on 25 January 2010. Retrieved 1 December 2016. ↑ "Absinthe (Prohibition) Act 4, Laws of the Republic of Vanuatu Revised Edition". 1988. Archived from the original on 6 October 2008. Retrieved 2008-09-17. ↑ ""The Hasher's Delirium" (1910) - film". Archive.org. Retrieved 20 February 2016. ↑ ""Absinthe" (1913) - A silent film". Progressive Silent Film List. Retrieved 20 February 2016. ↑ ""Absinthe" (1914) - A silent film". Progressive Silent Film List. Retrieved 20 February 2016. Crowley, Aleister (1918). "Absinthe: The Green Goddess" (PDF). “The International”. XII (2).